This next review will be done a tad differently than what I've previously done in the past. Something in the North American version of Pandora's Tower has prevented me from finishing the game. Thus, I cannot really give a score. You'll see what I mean with this review. That Binds With Pandora's Tower. When I say "rainfall", what does that mean to you? To Nintendo fans it meant a campaign to launch three Nintendo-published games that wouldn't hit North American shores unless their voices were heard-- thus, Operation Rainfall. Nintendo of America released the first game, Xenoblade Chronicles, though it was relegated to being sold on their online shop and through GameStop. 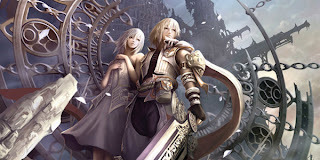 The second was released through XSEED Games, Hironobu Sakaguchi's The Last Story. Now, like pulling teeth, the third and final game of the trio has been released, and again by XSEED Games. 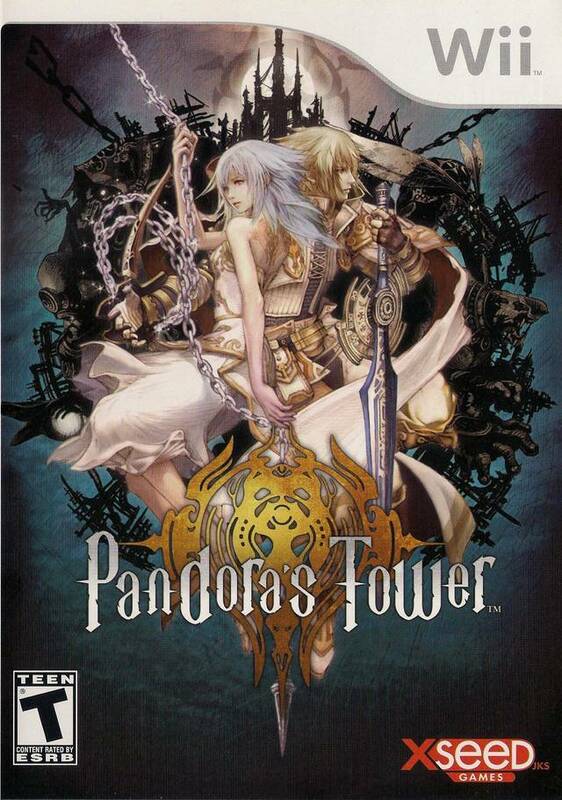 It's Pandora's Tower. Compared to the other two, how does this game rank? Singing at a harvest festival, suddenly the maiden Elena is stricken with a curse. Aeron takes her in and the two head out of the kingdom with the army right on their trail, alongside a peddler named Mavda, who knows more about Elena's curse than she initially lets on. The trio leave for a safe, desolate location where they cannot be found easily, The Scar. It is there where the instructions on how to purge the curse are revealed. Armed with the Oraclos Chain, a strong will and a fierce devotion, Aeron needs to head into the Thirteen Towers, defeat each master inside, take their flesh and feed it to Elena before her curse turns her into a monster forever. Through feeding Elena the required amount of master fleshes, her curse will be removed. Aeron and Elena, sitting in a tree... etc. Aeron is the type of character that isn't very outspoken. To say he's a lot like the Legend of Zelda's Link wouldn't be a stretch. By that, you could say that Aeron is meant to be an extension of the player, and this task is done well. The developers have successfully made Elena's character type one that you actively want to help and relieve her of her curse. For instance, I felt nice giving her gifts to boost Aeron and Elena's affinity (which affects which ending you obtain), and I got a feeling of unease and pity seeing her transformation into a monster get progressively worse as the gauge depletes. If the gauge empties, the curse overtakes Elena and the game is over. diet just didn't work for Elena. This is why time management is an important part of Pandora's Tower. You're always needing to look at the gauge and determine what you do and don't have time to do. Monsters when downed will flash red, and if you use your Oraclos Chain to tear off from the corpse, you can usually get a hunk of flesh. It is these pieces of flesh that will sustain Elena's human appearance while she waits to eat the master flesh. This means you will have to routinely exit and return to the tower you're currently on, which can be tedious at times. Thankfully, there are shortcuts in the form of extendable ladders and removing bars from doors that open a more direct path to progress much faster than Aeron would be able to otherwise. Break all the chains to reach the master's lair. 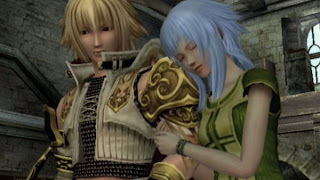 When you return to the Observatory, the hub of Pandora's Tower, you can do a myriad of tasks-- giving gifts to Elena, having her translate texts Aeron comes across in the many towers, resting to change the time of day as well as to regain lost health, buy, sell, create and upgrade goods with Mavda's help, store leftover items in the trunk, and feed Elena flesh. With the Oraclos Chain, Aeron can reach places that he otherwise would not be able to. Latching onto rocks to pull himself to higher areas, throwing rocks at enemies, grabbing out-of-the-way levers to pull them and move lifts, and swinging across a chasm to another platform are all useful tasks the Oraclos Chain brings to exploring the many towers of the game. 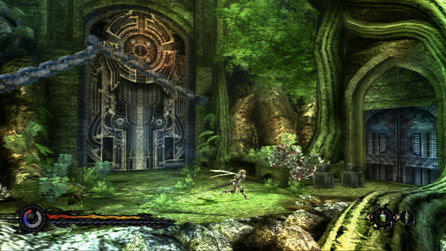 Outside of exploration, the Oraclos Chain is an invaluable tool for combat. It can wrap up foes in its chain, allowing you to charge the attack up before ripping the chain from the enemy, causing great damage. Or, if your prefer, you can bind a foe in the chain while you let loose on them with your subweapon. You can even tie two enemies together. Attacking one will damage the other. Combat is a tad deep in Pandora's Tower, and that's thanks to a lack of lock-on. You need to attack and evade with good timing, or else you'll quickly be returning to your last checkpoint over and over again. Aeron does his best Scorpion impression. Besides enemies that won't hesitate to cut you down to size, there is another foe to be found in Pandora's Tower and it is one that isn't unfamiliar to players of 3D games. It's the camera. 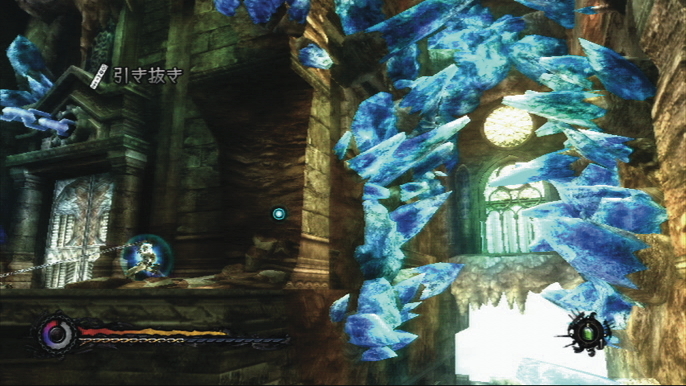 Pandora's Tower uses a fixed viewpoint for many of its rooms. This can make judging depth perception a serious problem. There are also times where the foe you are fighting is off screen while Aeron is still on screen, making knowing when to dodge an attack next to impossible. Combat is really fun in Pandora's Tower. 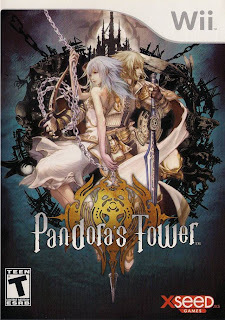 Pandora's Tower can be played by using the Wii Remote and Nunchuk control combination or with the Classic Controller. Both methods work well. It's much quicker and easier to point at what you want to chuck your chain at with the Wii Remote rather than using the right analog stick of the Classic Controller. 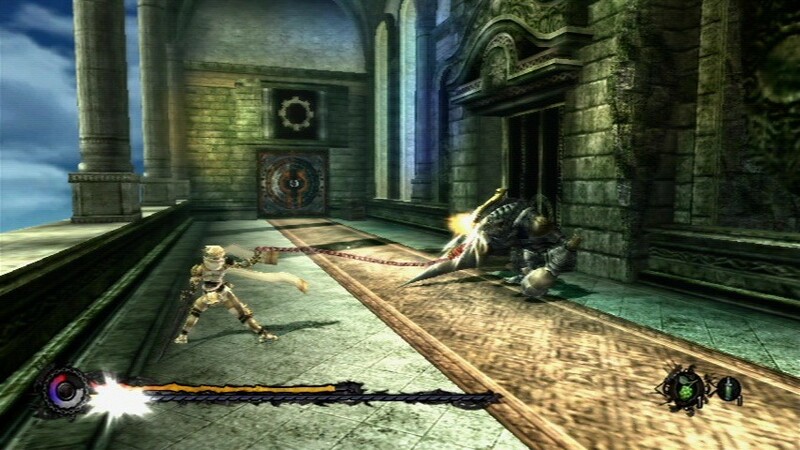 It's also fun to pull the Wii Remote to tear armor off enemies and inflict damage that way. However, the Classic Controller does offer the freedom of not needing to occasionally fight with the motion controls. It just comes down to preference, as I made it far in the game with the former control method. There are at least twelve playable towers in the game. The first five must be played in a linear order while the second five can be played in any order you desire. Each has its own theme, set of enemies, and challenges. A tower like Torrent Peak has a gushing waterfalls with rising rocks inside them that can be latched onto, taking Aeron to higher floors. Meanwhile, Blazing Citadel packs heat of the literal kind, with platforms that sink into the lava pits and cauldrons that will cook anyone's goose. Each tower has its own theme. Each tower has a set number of chains that must be destroyed in order to unlock the way to the tower's master. Getting to each room is a challenge onto itself. Fortunately, a helpful map shows where you have previously been to assist you when things get a little confusing. A master awaits you at the top of each tower. A lot of these bosses require both brains and brawn to complete if you wish to retrieve some master flesh for Elena. (You do, don't you? Have a heart.) One master will constantly turn its exposed spot away from you. However, you can tie the boss to one of its stalactites to prevent it from turning around, allowing Aeron to attack its weak spot for massive damage. (Yes, people like me still use that reference.) A lot of the bosses are fun to fight and the battles are tests of endurance. Some, though, are just obnoxious and frustrating-- a bad combination for any game. Talk about a green giant! Pandora's Tower might not be the prettiest game on the Wii, as textures are quite gnarly in appearance, even far away, but it does push the Nintendo's last generation system well enough. 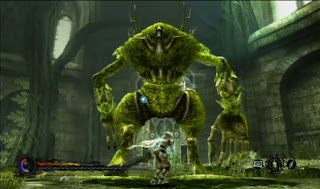 Towers have a great sense of scale and dramatic ambiance, and the enemies that infest the dungeons animate rather well. The voice acting is also considerably good, offering nothing that could be considered hammy by any stretch of the imagination. Lastly, the music of Pandora's Tower is splendid, showcasing a stimulating and tense mood inside dungeons and feathery and delightful at the observatory where Elena spends her days. All of this sounds very good. After all, Japanese and PAL players have been enjoying Pandora's Tower for a year now. Unfortunately, North American gamers have been forced to wait, and that wait did not pay off. 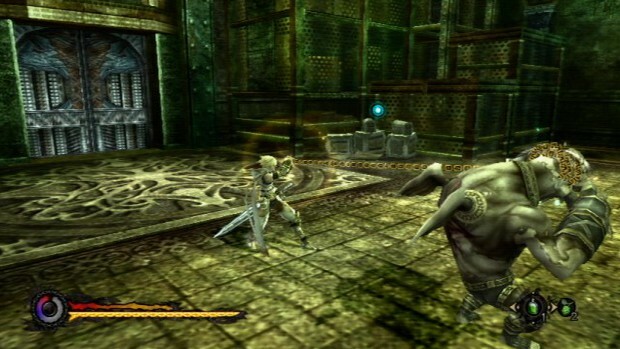 Nintendo didn't decide to publish Pandora's Tower in North America. Instead, XSEED Games took on that role. Somehow, however, in bringing the game to our side of the world, they accidentally implemented something that could be close to being called a game-breaking bug. Not just a game-breaking bug, but one that happens late in the game. When trying to return to the eleventh and twelfth towers, the game will freeze. I tried doing a number of things to get around this bug, but as luck would have it, each time I encountered the freeze, which made me have to pull the plug on my Wii to even get the system to respond again. How this glitch was put in the North American version and nowhere else bewilders and frustrates me to no end. I was really liking Pandora's Tower up to that point, too-- wonky camera and all. It's a shame that the North American version of Pandora's Tower has such a broken (but not impossible to pass) glitch in it. It made what was a really enjoyable action-adventure game turn into what I feel was a waste of time. Considering this is such a niche title and XSEED Games is the publisher, a fix for this issue is most likely nothing but a pipe dream. While the gameplay is unlike anything else on any platform, the frustration of running into the glitch ruins the game for me. Yes, the Oraclos Chain isn't the only thing that binds, the complete screw up by XSEED does as well.